The personal trimmer that keeps you perfectly groomed in between hair cuts. You look and feel great after a haircut, but until now there&apos;s been no way to keep that perfectly groomed look in between haircuts. Introducing Micro Touch Max, the latest creation from the makers of the Finishing Touch and Micro Touch personal hair remover. MicroTouch Max removes unwanted hair instantly and painlessly. But its extra large size, special grip and stronger motor are designed especially for a man-50 percent MORE POWER! MicroTouch Max is great for keeping the back of your neck barbershop perfect, or keeping sideburns straight and even great for the back, neck, eyebrows and nose. And now it comes with a built-in LED light to really illuminate those hard reach and hard to see areas! It gets close as a blade, yet is safe to the touch. 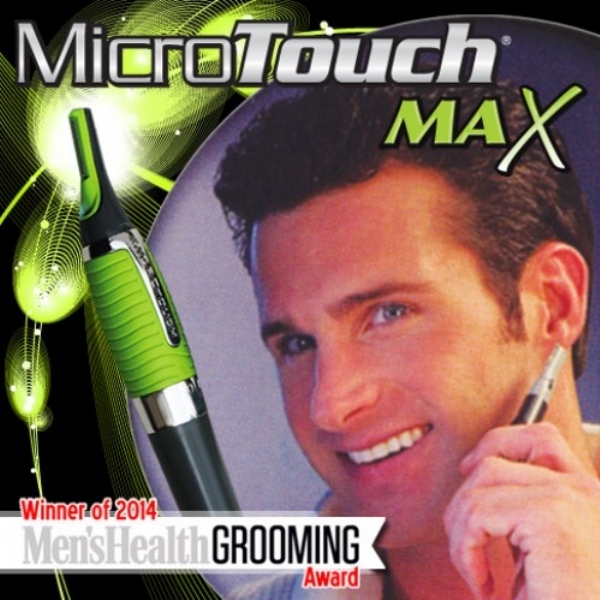 MicroTouch Max is the ideal solution for removing unwanted ear and nosehair, and makes trimming mustaches and beards easy. The special snap on guide lets you groom bushy eyebrows without removing too much hair. The same goes for shoulders, arms, chest and back-remove a little or remove a lot. MicroTouch is powerful enough for the tough stuff, yet gentle enough to use on the most sensitive areas. It&apos;s the safe, precise solution for all of a man&apos;s grooming needs. My wife gave me this MicroTouch Max hair removal gadget and when I used it, It was awesome. Removed hair out of my ears, nose and back of my neck. I find myself using it all the time now!! GREAT I JUST LOVE IT..